Days after a shooting that left 49 dead and more than 50 hospitalized at an LGBT night club in Orlando, Florida, Senator Claire McCaskill (D-MO) has taken part in a Demcratic fililbuster of gun control legislation, as Democrats pushed for universal background checks on gun purchases, and a ban on letting people on the terror watch list buy guns. 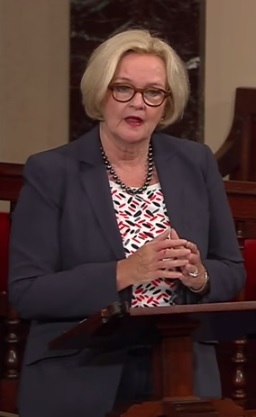 McCaskill read a message she said came from a 14-year-old girl in St. Louis, talking about things she wanted to do like graduating and going to prom, getting married and having children. “‘But since Missouri voted that those on terrorist watch lists can purchase guns, I’m scared that I won’t be able to do those things,'” McCaskill read. McCaskill noted it was Congress, not Missouri, that voted to allow people on terror watch lists to purchase guns. She continued reading, “that we were not going to take the common sense step of saying that if the most trusted law enforcement professionals in the world – the most professional and highly trained – have put an individual on the terrorist watch list, that we should not let them buy guns in this country.’ Pretty common sense, and a 14-year-old knows it, and she’s scared,” said McCaskill. Republicans say there are conflicts with the constitutional right to due process in the gun control proposal. McCaskill also criticized Republicans for opposing background checks for gun purchases made at gun shows. Senator Roy Blunt (R-MO) has said tougher gun laws don’t address the problem of people like the shooter in Orlando being radicalized.